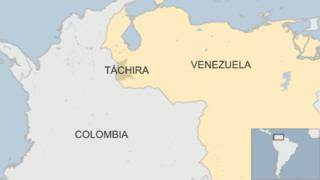 Seven bodies have been found in a mass grave on the border between Venezuela and Colombia, say officials. Venezuelan troops found the corpses of six men and one woman in Tachira state on Monday, only 4km (2.5 miles) from the border with Colombia. How they died is not yet known but reports say that the bodies were found tied together with barbed wire and had gunshot wounds. Local media said that they were all in an advanced state of decomposition. On Tuesday, Alejandro Garcia, the local mayor, confirmed the finding and told reporters that the bodies also showed signs of torture. He added that the mass grave may not be the only one to be found in that area. "It is presumed that there are other mass graves. That is the information that the armed forces are working with," he said, as quoted by El Nacional newspaper. Local media report that forensic teams have reached the area and are working to exhume all of the remains. The border location between Colombia and Venezuela is known to be dangerous, with paramilitary groups, smugglers and drug gangs all operating in the area.